To begin the webinar and obtain the STAR PCP materials, please fill out the user form below. The materials will be emailed to you within 3 business days of submitting your information. Please contact lroberts@usfsp.edu with any questions. The Florida Consortium on Postsecondary Education and Intellectual Disabilities developed a 25-minute webinar detailing the Students Transitioning to Adult Roles (STAR) Person-Center Planning (PCP) process. All that is required is filling out a brief form which provides immediate access to the webinar. The form will then generate an email with the STAR PCP materials to the user. After viewing the webinar, users will receive an email with the Facilitator’s Guide, STAR PCP PowerPoint, and the STAR PCP Student Orientation PowerPoint. The STAR PCP webinar shares the vision and goals of the process as well as describes the participant roles, steps, and related documents used throughout the process. 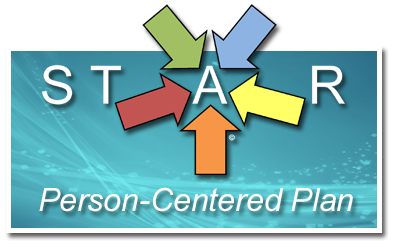 The STAR PCP was designed to ensure students with disabilities who are transitioning into postsecondary programs have the opportunity to plan their own future with the support and encouragement of other adults in their lives. For a full transcription of the webinar audio, please click on the notes page, located in the tab to the right of the PowerPoint on each slide.